Among the items stolen from property were my cell phone which william dickie took from property and used to obtain the phone numbers for my cousin Homa Khanoum Basseri-Teymourian and for Marjan Faritous/Persia Pele which dickie used to make threatening calls to in June 2014, and in 2012 when an engraved Austrian Mint safety letter opener was stolen by pig ivan tavarez. The reporter neglects to mention that this has been normal behavior since January 2003 when esserman became providence pig chief. Justice would be to have the hands chopped off these thieving pigs who use their badges as an excuse to do whatever they want. PROVIDENCE, R.I. -- A 36-year veteran Providence police officer has been indicted on charges of stealing a gun, diamond ring and money from the police department's property room. Michael McCarthy, 61, of Warwick, will be arraigned March 6 at Providence County Superior Court on charges of larceny of a firearm, receiving stolen goods, felony larceny over $1,500 and embezzlement. The attorney general's office announced the grand jury indictments on Friday. The Providence police began investigating McCarthy last fall, after a diamond ring that had been recovered from a theft disappeared. That led to an overall audit of the entire property room and the realization that there were more items missing. McCarthy had been assigned to the property and evidence room for several years. He didn't have access to drugs seized by police, but he did have access to jewelry, money, firearms and other items. The police initially arrested him in October on a felony charge of fraudulent conversion and suspended him without pay from the department, as the criminal and internal affairs investigations continued. He has been out on $5,000 personal recognizance. The police chief said at the time that it was the patrolman's first offense in his long career. This way the people who the Tsarnayev's did their raid for and those who have been effected by their actions will be heard. Recently John B Welles fell for those who call the Tsarnayev raid, aka the boston marathon bombing, a hoax, by hosting david weiss of deep inside the rabbit hole and an australian who uses the pseudonym’s pete k and peekay on his caravan to Midnight show on it’s episode 232 which he aired on February 22, 2015 . 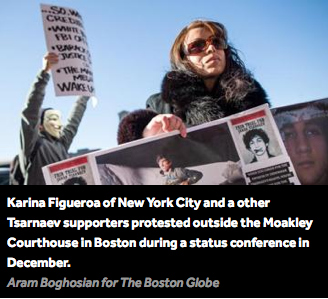 Those aforementioned individuals base their beliefs that the Tsarnayev raid, aka the boston marathon bombing, is a hoax by analyzing media photos and videos of what occurred on April 15, 2013 at the marathon bombing and none of the other actions of the Tsarnayevs, except to call them plants and to kick around rumors of their shootout and takedown. By their doing so they have spent NO time in Watertown, Cambridge, Boston, or any of the locations where the Tsarnayev’s did their raid, NO time talking to those effected firsthand by the actions of the Tsarnayevs and who knew them, and most important, would NOT describing how they did the forensic analysis of the photos and videos of the Tsarnayev raid, aka the boston marathon bombing or where they obtained them initially. By their doing this no only are they demonstrating their lack of credibility, they are disgracing on the very principles which sparked the Tsarnayev’s to do their raid, namely freedom from persecution and police state torture, and belittling those who have been effected by the Tsarnayev raid, aka the boston marathon bombing, the latter which all three seem to enjoy doing. Considering how peekay calls the Sandy Hook incident a hoax without any similar examination, and how John B Welles decries those in Ferguson who are rioting against persecution and police state torture this is not surprising, but shocking nonetheless, for while australians are known for their reputation for discrimination against those of none anglo-saxon heritage, I expected more from John B Welles who until this moment has been impartial and unafraid to speak the truth, which cost him his spot on coasttocoastam. If John B Welles and any of his guests wish to further claim the Tsarnayev raid, aka the boston marathon bombing is a hoax I have two challenges for them. 1. Come to Boston, Watertown, and the places the Tsarnayev raid, aka the boston marathon bombing, occurred and the places the Tsarnayevs spent time. If they are unable to meet these challenges then they need to stop talking about the John B Welles spreads lies about the Tsarnayev raid, aka the boston marathon bombing for they are guaranteeing that they and others in america will end up in some prison like the ones which inspired the Tamerlan Tsarnayev to do his raid. If conflict happens it will ruin both france and america. While this story is making the rounds in the media, the French President has yet to release any official statement on the two Amphibious carriers built jointly with and for Russia. Hopefully, these ships will be delivered to Russia, as they were an important bargaining chip in the recent settlement on ukrainya. It will be interesting to see how this is implemented.